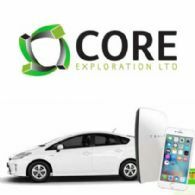 Emerging Australian lithium developer, Core Exploration Ltd (ASX:CXO) is pleased to announce that the Company has received a Certificate of Registration on Change of Name from ASIC and its name is now Core Lithium Ltd. Emerging Australian lithium developer, Core Exploration Ltd (ASX:CXO) (FRA:7CX) is pleased to announce new exploration results for drilling between the Lees and Booths Prospects that supports the exploration model that the two prospects are geologically linked. Core Exploration Ltd (ASX:CXO) continued exploration of our Finniss Lithium Project during 2017/18, including the lodging of an application for a Mining Lease at Grants in October 2017. Emerging Northern Territory lithium developer, Core Exploration Ltd (ASX:CXO) (FRA:7CX), is pleased to announce a substantial Mineral Resource upgrade for its BP33 Lithium Deposit at the Finniss Lithium Project in the Northern Territory. Emerging Australian lithium developer, Core Exploration Ltd (ASX:CXO), is pleased to announce new exploration drill results from the Lees, Booths and Sandras prospects and a number of other prospects within Core&apos;s 100%-owned Finniss Lithium Project in the Northern Territory. 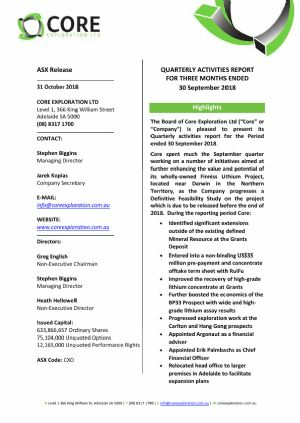 The Board of Core Exploration Ltd (ASX:CXO) is pleased to present its Quarterly activities report for the Period ended 30 September 2018. Core Exploration Ltd (ASX:CXO) provides the Company&apos;s Benchmark Cathodes Presentation. Emerging Northern Territory lithium developer, Core Exploration Ltd (ASX:CXO) is pleased to announce a substantial Resource upgrade for its Grants Lithium Deposit at the Finniss Lithium Project in the Northern Territory. Core Exploration Ltd (ASX:CXO) is pleased to announce that the Mineral Resource for its 100%-owned Napperby Uranium Deposit in the Northern Territory has been re-estimated to follow the JORC 2012 Code guidelines. The Napperby Uranium Inferred Mineral Resource estimation defined by SRK Consulting comprises 9.54Mt at 382ppm U3O8 for 8.03 Mlb of contained U3O8 at a 200 ppm U3O8 cut-off. 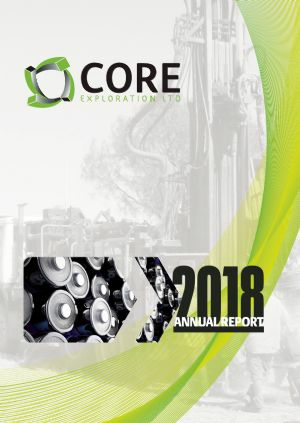 Core Exploration Ltd (ASX:CXO) provides the Company&apos;s 2018 Annual Report to Shareholders. Emerging Australian lithium developer, Core Exploration Ltd (ASX:CXO), is pleased to announce an update as the Company plans toward production of high-quality lithium concentrate in 2019. Core Exploration Ltd (ASX:CXO) provides the Company&apos;s Benchmark World Tour Presentation. Core Exploration Ltd (ASX:CXO) provides the Company&apos;s latest presentation at Mining the Territory Conference. Emerging Australian lithium developer, Core Exploration Ltd (ASX:CXO) is pleased to announce that it has appointed Argonaut as a financial adviser. Emerging Australian lithium developer, Core Exploration Ltd (ASX:CXO), is pleased to announce several new high-grade intersections returned from the current RC drilling program designed to grow the existing resource base at the BP33 Prospect within Core&apos;s 100%-owned Finniss Lithium Project near Darwin in the Northern Territory. Emerging Australian lithium developer, Core Exploration Ltd (ASX:CXO), is pleased to announce new exploration drill results from Carlton and Hang Gong, which are located on mining tenure located within 1.5km from the Grants Lithium Deposit. 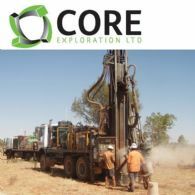 Core Exploration Ltd (ASX:CXO) provides the Company&apos;s Diggers and Dealers Presentation. 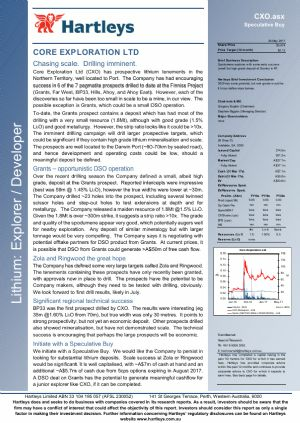 Emerging Northern Territory lithium developer, Core Exploration Ltd (ASX:CXO) is pleased to announce a strongly positive update on metallurgical results achieved since the release of the Pre-Feasibly Study, which are expected to further enhance the robust economics demonstrated by the PFS. The Board of Core Exploration Ltd (ASX:CXO) is pleased to present its Quarterly activities report for the Period ended 30 June 2018. 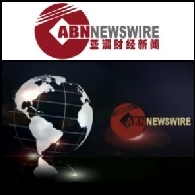 Emerging lithium developer Core Exploration Ltd (ASX:CXO) is pleased to announce that it has entered into a non-binding term sheet with one of China&apos;s largest lithium producers, Shandong RuiFu Lithium Co Ltd. Core Exploration Limited (ASX:CXO) advises that 26,154,683 shares held by Liontown Resources Limited (ASX:LTR) have been crossed by LTR&apos;s broker to a number of investors. Emerging lithium developer Core Exploration Ltd (ASX:CXO) is pleased to announce the return of wide, high-grade intersections confirming the discovery of significant extensions to the Grants Lithium Deposit, part of the Company&apos;s wholly-owned Finniss Lithium Project, located near Darwin in the Northern Territory. Emerging Northern Territory lithium developer, Core Exploration Ltd (ASX:CXO) is pleased to announce the discovery of significant extensions to the Grants Lithium Deposit, part of the Company&apos;s wholly-owned Finniss Lithium Project, located near Darwin in the Northern Territory. Core Exploration Ltd (ASX:CXO) provides the Company&apos;s latest presentation at AusIMM Lithium Conference. Emerging Northern Territory lithium producer, Core Exploration Ltd (ASX:CXO) is pleased to announce the release of its Pre-Feasibility Study for the Grants Lithium Deposit, a key component of the Company&apos;s wholly-owned Finniss Lithium Project, located near Darwin in the Northern Territory. Emerging Australian lithium developer, Core Exploration Ltd (ASX:CXO) is pleased to announce that drilling has commenced to discover, expand and define substantial additional lithium resources of the Finniss Lithium Project in the Northern Territory as the 2018 field season opens. Emerging Australian lithium developer, Core Exploration Ltd (ASX:CXO), is pleased to announce a maiden Mineral Resource estimate for the BP33 Lithium Deposit, which has further increased the overall Mineral Resources of the Finniss Lithium Project in the Northern Territory to 3.45 million tonnes @ 1.4% Li2O. Core Exploration Limited (ASX:CXO) is pleased to announce that it has issued 15,571,733 fully paid ordinary shares under the Company&apos;s Share Purchase Plan (SPP) as announced on 20 April 2018. Core Exploration Limited (ASX:CXO) is pleased to announce that it has issued 26,415,094 fully paid ordinary shares as announced on 7 May 2018. The Company has issued the Shares to Ya Hua International Investment and Development Co. Ltd under a share placement raising $1,400,000 (before costs). Core Exploration Ltd (ASX:CXO) is pleased to announce a Resource upgrade for its Grants Lithium Deposit at the Finniss Lithium Project in the Northern Territory which has more than doubled the size of the Indicated Resource and substantially increased the Resource confidence ahead of Feasibility studies to be completed in 2018. Emerging Australian lithium developer, Core Exploration Ltd (ASX:CXO) is pleased to announce that it has been advised by the Australian Taxation Office that its application to participate in the EDI scheme has been accepted, and a tax credit of up to $952,967 will be distributed to eligible shareholders. The Board of Core Exploration Ltd (ASX:CXO) is pleased to present its Quarterly activities report for the Period ended 31 March 2018. Core Exploration Ltd (ASX:CXO) is pleased to announce that it has been advised by the Australian Taxation Office that its application to participate in the JMEI scheme has been accepted and the Company has received an allocation of up to $750,000, which can be distributed to eligible shareholders. Core Exploration Limited (ASX:CXO) is pleased to announce that it is issuing 95,283,970 fully paid ordinary shares as announced on 16 April 2018. The Company will issue the Shares to sophisticated, professional and institutional investors under a share placement raising $5,050,050 (before costs). Core Exploration Limited (ASX:CXO) is pleased to offer eligible shareholders with the opportunity to subscribe for up to $15,000 of new fully paid ordinary shares in the Company, free of brokerage and commission, under a Share Purchase Plan. 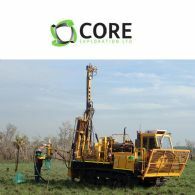 Core Exploration Limited (ASX:CXO) is pleased to announce that it has received firm commitments to place approximately 95.3 million new shares at an issue price of A$0.053 per share to raise approximately $5 million, excluding costs. Emerging Australian lithium developer Core Exploration Ltd (ASX:CXO) is pleased to announce that assays results have been returned for the 86m continuous intersection of spodumene pegmatite that was drilled at the BP33 Prospect in February. Australian lithium developer, Core Exploration Ltd (ASX:CXO) is pleased to announce that new assay results received from RC and diamond core infill drilling continue to demonstrate the remarkable consistency of high-grade spodumene intersections at the Grants Deposit, within Core&apos;s 100% owned Finniss Lithium Project near Darwin in the NT. Core Exploration Ltd (ASX:CXO) provides the Company&apos;s latest presentation at Mines and Money Conference. Core Exploration Ltd (ASX:CXO) provides the Company&apos;s latest presentation at INFORMA Lithium and Battery Conference. Core Exploration Ltd (ASX:CXO) is pleased to announce multiple intersections of high-grade lithium from drilling at the Grants Lithium Deposit within Core&apos;s 100% owned Finniss Lithium Project near Darwin in the NT. Core Exploration Ltd (ASX:CXO) is pleased to announce a new high-grade intersection of 42.9m @ 1.39% Li2O at the BP33 Prospect within Core&apos;s 100%- owned Finniss Lithium Project near Darwin in the NT. The Directors of Core Exploration Ltd (ASX:CXO) present their Report together with the financial statements of the consolidated entity, being Core Exploration and its controlled entities for the half year ended 31 December 2017 and the Independent Review Report thereon. Core Exploration Ltd (ASX:CXO) is pleased to announce that an 86m continuous intersection comprising spodumene pegmatite has been drilled at the BP33 Prospect within Core&apos;s 100%-owned Finniss Lithium Project near Darwin in the NT. Core Exploration Ltd (ASX:CXO) is pleased to announce that new wide and high-grade lithium intersections have identified substantial strike and depth extension potential at Core&apos;s 100% owned BP33 pegmatite within its Finniss Lithium Project. Following on from its recent announcements regarding the recommencement of resource drilling at the high-grade BP33 and Grants Prospects, Core Exploration Ltd (ASX:CXO) is pleased to announce that, it has now received high grade lithium assay results from Reverse Circulation drilling that took place on adjoining tenement EL30015 (Bynoe Project) in December 2017. Core Exploration Ltd (ASX:CXO) is pleased to announce that drilling has re-commenced at the high grade Grants lithium deposit on the Company&apos;s 100% owned Finniss Lithium Project near Darwin in the NT. The Board of Core Exploration Ltd (ASX:CXO) is pleased to present its Quarterly activities report for the Period ended 31 December 2017. Core Exploration Ltd (ASX:CXO) is pleased to announce that drilling has re-commenced in 2018 at its high grade Finniss Lithium Project near Darwin in the NT. Core Exploration Ltd (ASX:CXO) is pleased to announce new assay results from multiple drill intersections that confirm the potential of the 100%-owned Sandras Prospect to host high-grade spodumene pegmatite. 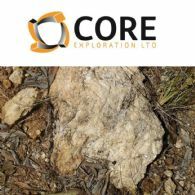 Core Exploration Ltd (ASX:CXO) is pleased to announce that, following its announcement last month of wide pegmatite intersections at Core&apos;s 100% owned high grade BP33 pegmatite, it has now received the assay results which have extended the wide, high grade spodumene intersections at BP33. Core Exploration Ltd (ASX:CXO) provides the Company&apos;s latest Investor Presentation. Core Exploration Limited (ASX:CXO) is pleased to announce that it has entered into a binding lithium offtake agreement and a conditional US$20 million prepayment agreement for its 100% Finniss Lithium Project near Darwin in the Northern Territory. Core Exploration Limited (ASX:CXO) advises that the Company has completed the second tranche of the previously announced placement to Ya Hua International Investment and Development Co. Ltd (refer ASX announcement on 29 August 2017). 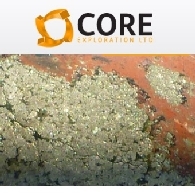 Core Exploration Ltd (ASX:CXO) is pleased to announce that, following its announcement last week of wide pegmatite intersections at Core&apos;s 100% owned high grade BP33 pegmatite, it has now received the assay results which confirm the presence of wide, high grade spodumene at BP33. Core Exploration Ltd (ASX:CXO) is pleased to provide the following update on its recently commenced exploration drilling on lithium pegmatite targets within the Company&apos;s newly acquired Bynoe Lithium Project tenements near Darwin in the NT. The Bynoe Lithium Project is located immediately adjacent to Core&apos;s high-grade lithium resource at the Grants deposit within the Finniss Lithium Project. 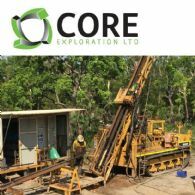 Core Exploration Ltd (ASX:CXO) is pleased to announce that the first drilling of 2017 at Core&apos;s 100% owned high grade BP33 pegmatite on the Company&apos;s lithium projects near Darwin has intersected the widest pegmatite intervals that have ever been drilled at BP33, exceeding prior expectations for the width of mineralisation at the northern end of BP33. Core Exploration Limited (ASX:CXO) is pleased to announce that it has lodged its Notice of Intent for the Grants Lithium Project with the Northern Territory Environment Protection Authority. Core Exploration Limited (ASX:CXO) is pleased to announce that it has successfully completed the acquisition of the Bynoe Lithium Project from Liontown Resources Ltd (ASX:LTR) announced on 14 September 2017. The Bynoe Lithium Project is located directly adjacent to Core&apos;s Finniss Lithium Project in the NT near Darwin with the combined area now covering over 500km2 of granted tenements near Darwin. The Board of Core Exploration Ltd (ASX:CXO) is pleased to present its Quarterly activities report for the Period ended 30 September 2017. Core Exploration Limited (ASX:CXO) announced on 29 August 2017 that it had entered into a binding Subscription Agreement and Framework Agreement with Ya Hua International Investment and Development Co. Ltd which is wholly owned by Sichuan Yahua Industrial Group Co. Ltd, one of China&apos;s leading lithium producers, for a two tranche placement of $2 million to Yahua. Core Exploration Ltd (ASX:CXO) provides the Chairman&apos;s 2017 AGM Address. Core Exploration Limited (ASX:CXO) is pleased to announce that it has applied for a Mineral Lease over its 100 per cent owned Grants Lithium Deposit, one of Australia&apos;s highest grade lithium deposits. The focus of Core Exploration Ltd&apos;s (ASX:CXO) activity during the year was on the Company&apos;s Finniss Lithium Project near Darwin where Core has defined the first Lithium Resource in the Northern Territory (NT), with a maiden resource of 1.8Mt at 1.5% Li2O. Core Exploration Ltd (ASX:CXO) is pleased to announce that it has received all outstanding assays relating to soil and rockchip sampling at the Barrow Creek Lithium Project in the Northern Territory. Core Exploration Limited (ASX:CXO) is pleased to announce that it has entered into an agreement to acquire the Bynoe Lithium Project directly adjacent to Core&apos;s Finniss Lithium Project in the NT near Darwin from Liontown Resources Ltd (ASX:LTR). Core Exploration Ltd (ASX:CXO) is pleased to announce that initial RC drilling at the large-scale Ringwood Prospect within the Finniss Lithium Project near Darwin in the NT has identified broad drill intersections above 0.1% Li2O within pegmatites up to 200m wide. Core Exploration Ltd (ASX:CXO) is pleased to announce that drilling of new pegmatite targets close to the high-grade Grants lithium resource has commenced, within the Company&apos;s 100% owned Finniss Lithium Project near Darwin in the NT. Core Exploration Limited (ASX:CXO) is pleased to announce that it has entered into a binding Subscription Agreement and Framework Agreement with Ya Hua International Investment and Development Co. Ltd which is wholly owned by Sichuan Yahua Industrial Group Co. Ltd, one of China&apos;s largest lithium hydroxide and carbonate producers, for a placement of $2 million to Yahua . Core Exploration Ltd (ASX:CXO) is pleased to announce that the Company&apos;s first RC drilling program at Zola has encountered broad intersections of pegmatite anomalous in lithium. Core Exploration Ltd (ASX:CXO) provide the "Mining the Territory Presentation" titled "Developing the first Lithium Resource in the NT". The Directors of Core Exploration Limited (ASX:CXO) write to you as a registered holder of Listed Options (ASX CXOOA) in the Company as at 3 August 2017. The Options are exercisable at $0.05 each on or before 31 August 2017, with each Option providing the right to purchase a single fully paid ordinary share in the Company. The Board of Core Exploration Ltd (ASX:CXO) is pleased to present its Quarterly activities report for the Period ended 30 June 2017. Core Exploration Ltd (ASX:CXO) is pleased to announce that drilling of the large-scale Ringwood Pegmatite Swarm has commenced within the Company&apos;s 100% owned Finniss Lithium Project near Darwin in the NT. Core Exploration Ltd (ASX:CXO) is pleased to announce that RC drilling of the large-scale Zola Pegmatite Swarm has commenced today within the Company&apos;s 100% owned Finniss Lithium Project near Darwin in the NT. The Directors of Core Exploration Limited (ASX:CXO) are pleased to advise that Hartleys Limited has initiated research coverage of the Company. 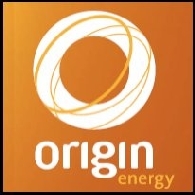 The report details the Company&apos;s lithium exploration activities at its Finniss project near Darwin in the Northern Territory. Core Exploration Ltd (ASX:CXO) is pleased to announce that it has been advised by the Australian Taxation Office that its application to participate in the EDI scheme has been accepted, and a tax credit of up to $317,736 will be distributed to eligible shareholders. Core Exploration Ltd (ASX:CXO) is pleased to provide the Company&apos;s latest presentation at Sydney Resources Round-up Conference. Core Exploration Ltd (ASX:CXO) is pleased to announce that lithium exploration programs have commenced for the 2017 field season on the Company&apos;s 100% owned Finniss Lithium Project near Darwin in the NT. Core Exploration Ltd (ASX:CXO) is pleased to announce Grants Lithium Deposit as the first Lithium Resource defined at it Finniss Lithium Project in the Northern Territory, with a maiden resource of 1.8Mt at 1.5% Li2O. Core Exploration Ltd (ASX:CXO) is pleased to present its Quarterly activities report for the Period ended 31 March 2017. Core Exploration Ltd (ASX:CXO) is pleased to announce that further pegmatite targets have been generated, and some previously identified pegmatite targets upgraded, following interpretation of recently acquired airborne magnetics at the large-scale Ringwood Pegmatite Prospect at the Finniss Lithium Project near Darwin in the NT. Core Exploration Ltd (ASX:CXO) is pleased to announce outstanding results from its initial metallurgical test work for the Grant&apos;s Pegmatite at the Finniss Lithium Project near Darwin in the Northern Territory. Core Exploration Ltd (ASX:CXO) is pleased to announce that it has executed a non-binding Heads of Agreement with Darwin Port Operations Pty Ltd as trustee for the Darwin Port Manager Trust in respect of Core&apos;s potential future use of the East Arm Wharf to export lithium products from its Finniss Lithium Project in the Northern Territory. 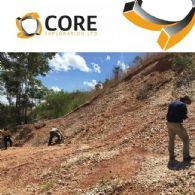 Core Exploration Ltd (ASX:CXO) present their Report together with the financial statements of the consolidated entity, being Core Exploration and its controlled entities for the half year ended 31 December 2016 and the Independent Review Report. Core Exploration Ltd (ASX:CXO) is pleased to announce that it has now received the final Phase 2 RC and Diamond drilling results from its 2016 drilling program at its Finniss Lithium Project near Darwin in the Northern Territory. Core Exploration Ltd (ASX:CXO) is pleased to provide the Company&apos;s latest Finniss Lithium Project Presentation at RIU Conference and Investor Briefings Perth. Core Exploration Ltd (ASX:CXO) is pleased to announce that bonanza drill intersections have been received in the latest batch of results from the Phase 2 RC drilling at the Grants Prospect. Core Exploration Ltd (ASX:CXO) is pleased to announce that it has received further high grade lithium assays from its Phase 2 RC regional drilling program at the Company&apos;s 100% owned Finniss Lithium Project near Darwin in the NT. Core Exploration Ltd (ASX:CXO) is pleased to announce that the granting of two new Exploration Licences has resulted in an increase in granted tenure of 250% at the Company&apos;s 100% owned Finniss Lithium Project near Darwin in the NT. The Board of Core Exploration Ltd (ASX:CXO) is pleased to present its Quarterly activities report for the Period ended 31 December 2016. Core Exploration Ltd (ASX:CXO) is pleased to provide an update on its active exploration and drilling programs at the Company&apos;s 100% owned Finniss Lithium Project near Darwin in the NT. 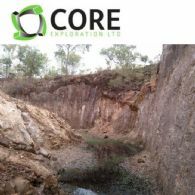 Core Exploration Ltd (ASX:CXO) is pleased to announce that it has acquired a 100% interest in granted Exploration Licence 31058 comprising 574km2 in the Barrow Creek Pegmatite Field in the NT, building on the Company&apos;s successful discovery of high grade spodumene pegmatites at the Finniss Lithium Project ("Finniss"). 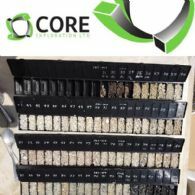 Core Exploration Ltd (ASX:CXO) is pleased to announce that high grade lithium assays have now been received from its Phase 2 RC program at the Far West North Prospect within the larger Finniss Lithium Project near Darwin in the NT ("Finniss"). Core Exploration Ltd (ASX:CXO) is pleased to announce that high grade lithium assays have now been received from its maiden diamond drilling program at the BP33 and Grants Prospects within the Finniss Lithium Project near Darwin in the NT ("Finniss"). Core Exploration Ltd (ASX:CXO) is pleased to provide the company&apos;s 2016 AGM Chairman&apos;s Address. Core Exploration Ltd (ASX:CXO) is pleased to announce that it has completed its maiden diamond drilling program at the Finniss Lithium Project near Darwin in the NT. All holes drilled at the high grade Grants lithium pegmatite have hit thick intersections of excellent quality coarse grained spodumene that is potentially amenable to processing to produce commercial grade spodumene concentrate. Core Exploration Ltd (ASX:CXO) advises that it has raised approximately $3.0 million following the successful completion of its oversubscribed share purchase plan. 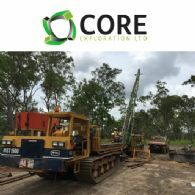 Core Exploration Ltd (ASX:CXO) is pleased to announce that Phase 2 Reverse Circulation drilling is underway on the Finniss Lithium Project near Darwin in the NT. 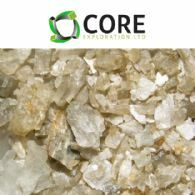 Core Exploration Ltd (ASX:CXO) is pleased to announce that the first diamond core from the high grade BP33 lithium pegmatite at the Finniss Lithium Project near Darwin in the NT ("Finniss") has revealed high quality coarse grained spodumene that is potentially amenable to processing to produce commercial grade spodumene concentrate. Core Exploration Ltd (ASX:CXO) is pleased to announce additional high grade lithium drill intersections from the Company&apos;s maiden drilling program on the 100%-owned Finniss Lithium Project, which consisted of 18 RC holes drilled on the Grants, BP33, Ahoy, Hills and Far West prospects. Core Exploration Ltd (ASX:CXO) is pleased to report it has discovered an additional large pegmatite swarm within the Finniss Lithium Project near Darwin in the NT. Core Exploration Ltd (ASX:CXO) is pleased to offer eligible shareholders with the opportunity to subscribe for up to $15,000 of new fully paid ordinary shares in the Company (New Shares), free of brokerage and commission, under a Share Purchase Plan (SPP or Plan). 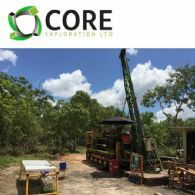 Core Exploration Limited (Core or the Company) (ASX:CXO) is pleased to announce that it has received firm commitments to place approximately 67 million new shares at an issue price of A$0.09 per share to raise approximately $6 million, excluding costs (Placement). Core Exploration Ltd (ASX:CXO) is pleased to announce the highest ever lithium drill intersection in the Northern Territory from the Grants Prospect at the Company&apos;s Finniss Lithium Project ("Finniss"), including 49m @ 1.78% Li2O from 71m. The Grants Prospect is the second pegmatite drilled during the Company&apos;s maiden lithium drilling program at Finniss. Core Exploration Ltd&apos;s (ASX:CXO) Directors have pleasure in submitting their report on the Company and its subsidiaries, for the year ended 30 June 2016. Core Exploration Ltd (ASX:CXO) is pleased to announce Core has been granted two key 100%-owned exploration licences (EL) covering 120km2 within the Finniss Project. Core Exploration Ltd (ASX:CXO) is pleased to announce that its first lithium drilling program at the Finniss Lithium Project in the Northern Territory has hit substantial pegmatite intersections at the first two lithium prospects drilled to date. Core Exploration Ltd (ASX:CXO) is pleased to announce that it has commenced the Company&apos;s first lithium focused drilling program at the Finniss Lithium Project in the Northern Territory. Core Exploration Ltd (ASX:CXO) is pleased to announce that it has exercised its option to acquire the Finniss Lithium Project exploration licence EL 29698 from AU Exploration Pty Ltd ("AUE"). 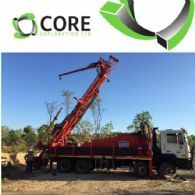 Core Exploration Ltd (ASX:CXO) ("Core" or the "Company") is pleased to announce that it has received all statutory approvals, and has appointed a drilling contractor, in preparation for its upcoming drilling program at the Company&apos;s Finniss Lithium Project in the Northern Territory. Core Exploration Ltd&apos;s (ASX:CXO) is pleased to report it has identified an exceptionally large pegmatite swarm within the Finniss Lithium Project near Darwin in the NT. The Zola Pegmatite is unusually large by world standards and represents an outstanding exploration target for lithium. Core Exploration Ltd (ASX:CXO) is pleased to announce that initial sampling of the Mt Finniss Mine (the largest historically producing pegmatite mine in the Northern Territory) within the Finniss Lithium Project has identified spodumene and other lithium minerals with lithium grades up to 0.8% Li2O. Core Exploration Ltd (ASX:CXO) is pleased to provide the following update on the Blueys Silver Project and NT Lithium Exploration. Core Exploration Ltd (ASX:CXO) is pleased to announce that it has been advised by the Australian Taxation Office ("ATO") that its application to participate in the EDI scheme has been accepted, and a tax credit of up to $328,389 will be distributed to eligible shareholders. Core Exploration Ltd (ASX:CXO) is pleased to present its Quarterly activities report for the Period ended 31 March 2016. Core Exploration Ltd (ASX:CXO) is pleased to announce key appointments it has made to add to its skills and expertise as the Company focusses on its Lithium Projects in the Northern Territory. Core Exploration Limited (ASX:CXO) is pleased to announce that it has received firm commitments from sophisticated, professional and institutional investors to place approximately 52 million new shares at an issue price of A$0.042 per share to raise approximately $2.2 million. 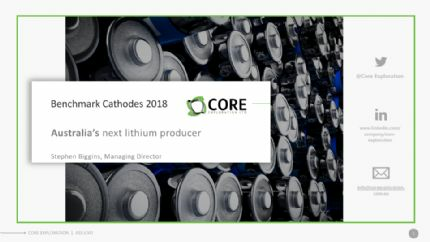 Core Exploration Ltd (ASX:CXO) are pleased to provide the latest Company Presentation regarding is NT lithium projects. Core Exploration Ltd (ASX:CXO) is pleased to announce that lithium evaluation and testing of the numerous historic mine workings has commenced on the Finniss Lithium Project near Darwin in the Northern Territory. 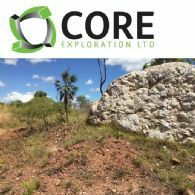 Core Exploration Ltd (ASX:CXO) has entered into an agreement with AU Exploration Pty Ltd which grants Core an option to purchase exploration licence EL 29698 covering 25 historically producing tin tantalum mines in the lithium rich Bynoe pegmatite field south of Darwin in the NT. Core Exploration Ltd (ASX:CXO) Review of Core Tenure Identifies Lithium Potential of NT Pegmatites. Core&apos;s research highlights that the Northern Territory has over a 100 years of history of tin and tantalum mining from lithium rich pegmatites similar to the mining history at Greenbushes in WA, one of the world&apos;s largest spodumene deposits. Core Exploration (ASX:CXO) received an independent report by Geoscience Australia which highlights the area covered by Core&apos;s Albarta Project in the Northern Territory as being highly prospective for uranium-rich IOCG deposits.